» Will I Get Cold Sores After Quitting Smoking? What Causes Cold Sores After Stopping Smoking? When Are You Most At Risk After Giving Up Smoking? When we think about quitting smoking, we only think of the benefits. But, many smokers want to understand the drawbacks after they quit. For instance, you may ask; ‘Will I get cold sores after quitting smoking?’ It’s one side effect that can have a significant impact on your decision. However, you do need to understand the reasons why cold sores may appear. It’s known that smoking is a bad habit – it can cause endless health problems, diseases, and even death. While we hardly need warnings about the risks of smoking cigarettes anymore, many people still choose to continue or find it difficult to quit. It’s estimated that nearly 7 in 10 smokers want to quit smoking. Of this number, 4 out of 10 adult smokers will attempt to give up this year. But, the potential side effects that go along with quitting, such as cold sores, can deter people. This article won’t try to outweigh the benefits of quitting smoking with the possible side effects. Most people are already fully aware of the benefits. However, the drawbacks may be hidden, and cold sores (or mouth sores) are not understood. So, the answer to the big question? Yes, cold sores after quitting smoking are a real possibility. Find out why! The reality? Cold sores, in general, can be caused by a multitude of different things. Some you can control but, when you stop smoking, you run the risk of developing them even stronger. So much so, in fact, that they are often called ‘mouth ulcers’ at that point. They can be unsightly, irritating, embarrassing, and even painful at times. This is because they dry up, form scabs, and crack. Most research has suggested that cold sores develop 1-2 weeks after giving up smoking. 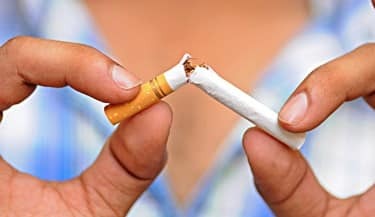 It’s during this time that many of those who are trying to quit will ‘give in.’ They’ll then go back to smoking to avoid mouth ulcers or additional side effects. Cold sores may be caused by a loss of antibacterial properties in the mouth that came from smoking. It’s hard to believe that smoking could cause anything beneficial, but your body becomes used to those properties. The cold sores could also be caused by a lack of antibodies produced by saliva. When you smoke, your saliva has to work overtime to produce antibodies to protect your mouth. Many symptoms of people who are trying to quit smoking come in the form of a common cold. This can also help to trigger or make cold sores worse. Things like coughing, sneezing, and lethargy are common side effects. Unfortunately, it’s also these side effects that bring people back to smoking. We don’t tend to think of smoking as any ‘serious’ drug. It’s easy to make light of things like nicotine patches or gum that make it ‘easy’ to quit. But, it is very much an addictive drug. If you’ve smoked for any length of time, it’s going to be a shock to the system. Your body will respond accordingly. The remedies and treatment options are no different from experiencing cold sores for any other reason. Your withdrawal symptoms will fade with time – it can usually take up to six weeks to be completely free of any symptoms. However, six weeks is a long time when you’re dealing with the mouth ulcers. So, there are a few things you should, and should not do. Try to avoid foods that will irritate or make the cold sores worse, such as citrus fruits, apples, tomatoes, figs, and strawberries. Anything extremely acidic can make the cold sores worse, or even trigger new ones. There are ways to treat them that reduce inflammation and help with the discomfort. If cold sores are not handled properly, they can be painful, and can ‘break’ open easily due to cracking. Should I Keep Cold Sores Moist or Dry for Faster Healing? Cold sores can be treated most easily by using over-the-counter antiviral ointments and creams, such as HERP-B-GONE. Click on the link to read our in-depth review. If you start treatment when you first notice the symptoms, they can be prevented. These ointments should be applied to the cold sore(s) several times a day. Not only will they help to lock in moisture, but their antiviral properties will work to heal the sores. If you’re struggling with your cold sores, you can see your doctor for medication. Common antiviral medications for cold sores include Famvir, and Valtrex, and offer the same antiviral properties as a cream or ointment, but are more concentrated. Talk to your doctor about options. Some common at home treatments include gently pressing an ice-cold washcloth against the sores, or even ice itself. Lip balm with lemon extract has also been known to soothe and help the healing process. Aloe vera can also be applied topically to the sores, known for its quick healing properties and soothing nature. Whether you use aloe vera juice from the plant itself, or a topical cream containing aloe vera, it can be a fantastic option for reducing discomfort. You can look for creams at your local pharmacy with Zinc Oxide, which contains similar healing properties. This can help to reduce itching and soreness from the ulcers. It can also help an outbreak from spreading, or more cold sores from forming. Deciding to give up smoking is a big step for a lot of people. Most people understand that it’s the right decision when it comes to improving their overall health. However, the side effects and withdrawal symptoms that can sometimes go along with the choice to quit can steer people back toward cigarettes sooner than they imagined. Will you get cold sores after quitting smoking? The chances are that you will. However, you can take comfort in the fact that if you can get through a one or two-week struggle when they will appear and feel the worst, they will disappear entirely over the course of a few weeks, as will the other withdrawal symptoms. Also, you’re more likely to get cold sores due to smoking. At least by quitting, the frequency of outbreaks will likely fall in the future. Quitting smoking is one of the best choices you could make for your body and your health. Cold sores, as unsightly and uncomfortable as they may be, will only be temporary. Nobody ever died from having cold sores. Besides, you can cut the healing time to 3 days with the Virulite device.